For the last three years, an associate from Honda Performance Development in Santa Clarita, CA has visited a local elementary school to do a community involvement project with the kindergarten class, and this year was no exception. In fact, this year provided some of the best racing yet by the Northpark Elementary kindergarten class. The project, based on a higher-level engineering project designed by the Society of Automotive Engineers (SAE), uses common household items to build self-propelled cars that then compete for top honors in the class. While the original higher-level project incorporates testing several variables that may affect the performance of the car, the challenge of car construction was enough to keep these kids, their teacher, and Mr. Aaron (as the class affectionately called him) sufficiently engaged. The cars themselves, constructed of a milk-carton chassis, with wheels made from push-pops, axles made from straws, a balloon power plant, all held together with several pieces of tape and glue, have also benefited from a couple years of evolution. “The previous versions of the cars used a chassis made from thick construction paper or paperboard that the children had to cut out, accurately fold, and tape together,” said Mr. Aaron. “While the kids were capable of all this, we found that there were inherent weaknesses. The chassis had to be enlarged to help the children handle the cars easier. This led to a weaker chassis overall. That, combined with what we have dubbed the “Slobber Factor,” resulted in several wetness-related chassis failures during, and even before, the final races. At the end of the day, the champion – who won three races to get to the top – was Aidan LeVan, followed by Davis Perkins in second place. Mr. Aaron’s car came in third, but as his was only an honorary entry, the actual award was given to Abigail Montoya who finished just behind Mr. Aaron. “Despite the affection of the class, I felt oddly alone on the starting line, as all the students that were not in the finals were cheering for the stude nts to beat me,” Mr. Aaron recalled. 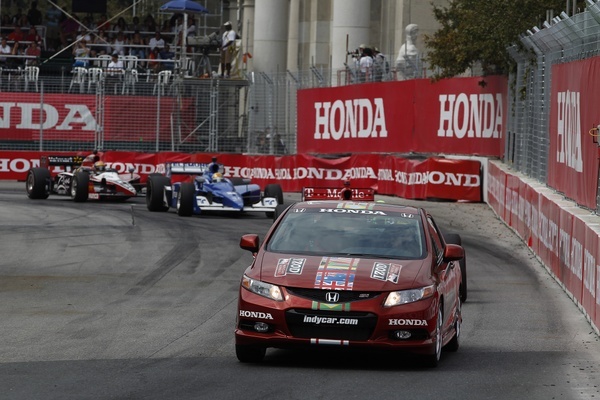 The late, great Warren Zevon would’ve loved the two recent Canadian IZOD IndyCar Series races in Toronto and Edmonton. There was enough slamming and banging in those two races to fill a full-season DVD. 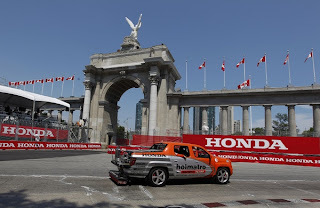 Historically, Toronto has always been a scene of frequent contact and short tempers – going all the way back to the first race in 1986, when even race winner Bobby Rahal was fuming at the finish (after a mid-race “stop-and-wait” penalty) and 10 of the 25 cars in the starting field were eliminated by crashes – including the likes of local hero Jacques Villeneuve (Gilles’ younger brother), Mike Andretti and Tom Sneva. Even so, this year was something else. By my unofficial count, at least 24 of the 26-car starting field had contact with other cars and/or the wall at least once at Toronto, while more than a half-dozen had two incidents of contact, and THREE (Alex Tagliani, Graham Rahal and Danica Patrick) were hitters/hittees no fewer than three times each. As near as I could tell, only Sebastien Bourdais and Simona de Silvestro were able to complete the race in unmarked cars. In purist terms, it wasn’t a g reat race. Heck, the [beautiful, new] Honda Civic Si pace car led 32 of the 80 laps! But it sure was entertaining, and it definitely ratcheted up the intensity factor as the IZOD IndyCar Series entered the second half of 2011. And the first half of the subsequent event at Edmonton looked to be more of the same. The VERSUS television crew certainly got into the act right from the show’s cold open, which featured a highlight video recap of all the Toronto crashing set to the music of Ce Lo Green’s “[Forget] You”. Classic. I laughed my head off in pit lane just listening to it on my scanner. And for the first 25 laps at Edmonton, it things appeared to be much the same. First, Alex Tagliani got sucked into a w-a-a-ay over-ambitious move at the end of the second straight, spearing into Rahal’s rear tire which, two turns later, sent Rahal into a spin and Paul Tracy over the top of him, ending both of their races. 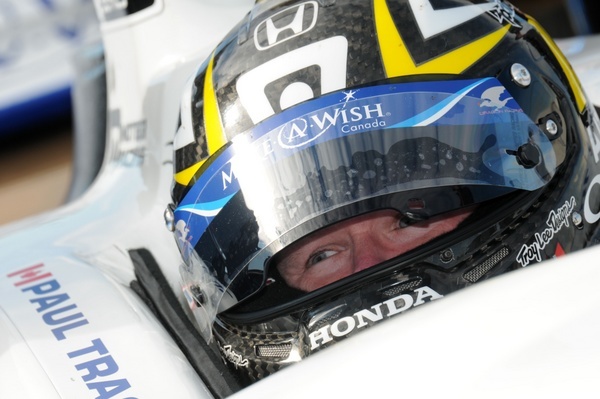 Wait a minute … Paul Tracy a victim of someone else’s brain lapse? Yep. More mayhem ensued (Mike Conway into Oriol Servia, E.J. Viso into Scott Dixon, and Ryan Hunter-Reay into pole qualifier Takuma Sato), but then things calmed down and a more “normal” IndyCar Series race broke out over the final 30 laps or so, with Will Power leading home teammate Helio Castroneves and Toronto winner Dario Franchitti. So now, the point race has tightened up a bit and we head into Honda’s midwestern “Home” race at Mid-Ohio. It looks to be a hot and humid weekend at Mid-O, and the temperature in the paddock is expected to be equally high, despite some of the “happy smiling faces” put on for public display. Postscript: Just as I was getting ready to hit “send”, the word came down from INDYCAR that Conway, Hunter-Reay and Tagliani had all put on probation by “the iron hand of justice” – aka Race Director Brian Barnhart. These three all had at least one instance of contact at both Toronto and Edmonton, and as a result, have received the IICS equivalent of “five-minute majors”… Now the question is: Will this dampen some of the “enthusiasm” of the Canadian races or only put more fuel on the fire?